New Boston Tether requirement is short against Randy’s forearm. One size doesn’t fit all! 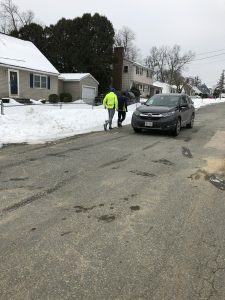 Running the Boston Marathon totally blind holds more than sufficient challenge, such as the arduous training requirements on snowbank-narrowed, ice-covered roads with bone-chilling temperatures and daylight shortened timing. Sure, I don’t need the light but my guides need the light and it is wise to ensure the various motorized vehicles see us clearly as well. Crowded race day conditions and intensely people-jammed water stops on the course are an additional challenge as we weave our way along the 26.2 mile course dodging obstacles and frequently narrowing sections as people weave, cluster in groups and, unsurprisingly, do not expect a sightless runner along their path. 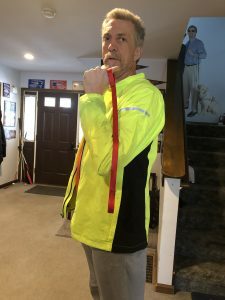 I join many visually impaired runners in having amassed a fair amount of experience in many races, including marathons, to practice the various techniques necessary for enhanced safety and success for ourselves and our fellow runners. This year, the Boston Athletic Association has unveiled several new requirements for Visually Impaired runners with the seeming intent to enhance the overall quality of the VI field in a similar fashion to the elite field of runners drawn to their typical field. Some of these changes are quite positive and work well towards that goal… and some create some seemingly unnecessary and problematic aspects with little or poor demonstrable reasoning. The tether changes are significant on this list and the point I’ll address in this blog. The BAA has elected to adopt the International Olympic Committee Track and Field tether requirements. On the outside, that seems to be reasonable until you consider that those requirements were not intended for a crowded marathon experience. Rather, they are for a more open running or even track conditions where elite runners need not worry about the heavy jostling environments faced commonly along the course of the Boston Marathon. This requires a 24-inch-or-less non-stretchable material be used. It is a one-size-fits-all solution creating enhanced challenge for my long arms and tall frame. Many of my VI peers are also deleteriously affected as they like the benefit of the stretchable material to keep from jerking them or their guides when arm motion or turns cause such a short tether to reach an abrupt limit. For me, I’ve used a rigid tether of longer length because I’m particularly tall and this enabled guide heights to vary greatly without the tether creating a problem. It allowed independent arm motion for both of us and most importantly of all, it enabled an option to “tuck behind’ my guide and run briefly in single file for narrow sections. This is invaluable at numerous points in a crowded race course and essential when training on roads where cars would prohibit the side-by-side their tether requires. Most of us provided this feedback and more to the Disability Coordinator for the BAA and were a bit surprised when many of the policies arrived. Randy and Guide Rodney running with white cane as rigid tether to allow tuck behind for narrow spots. Obviously we need to follow the race rules and find the best means to use this new system as well as possible. The reality is that it will require me to run side by side with my guide full time and with no offset to enable my guide to see anyone’s actions beside me. Narrowing parts of the course will be a challenge and we will need to be more obtrusive in our communication to those blocking wider access ahead of us with a tremendously increased risk at the water stops located constantly along the entire route. Given my past experience, I will be surprised if water-distracted runners do not on multiple occasions crash into us at these junctures even if we chose to skip water. I’ll note Boston doesn’t allow us to carry a back pack hydration system and so some form of water refueling would be necessary no matter what. I’m apprehensive about the additional challenge this new rule will add to my marathon experience. I take my first training run using this system on Super Bowl Sunday. We’ll run on the roads of my neighborhood in two-mile loops where the roads are wide enough and drivers generally aware of my blindness. Randy and Guide Rodney forced to side by side and double wide by new tether as car approaches. We’ll be prepared to switch to the old rigid tether if it provides too much difficulty, but we expect our step-down mileage for this weekend means we should be able to explore reasonably safely despite my inability to “tuck behind’ when cars are coming at us. This method precludes sidewalk use in most situations and on the roadside runs it increases our risk, likely forcing my guide to pull us over into a stop and step off which is disruptive to the training and still at some increased risk. Unfortunately, to not get extensive training with this tether prior to the race will increase the risk when running amongst the many people who will surround us commonly. I’ll share reports on how it goes, hope the practice makes progress mentality can steadily alleviate some of my concerns, and that the improved Boston start time of Wave 2 may give me plenty of more open road at least early in the race. Ultimately, I must abide by the rules or risk disqualification from a race which previously prided itself on inclusion but to my view took a major step back and one fraught with some safety concerns. Rodney and I had a step down mileage weekend for Superbowl Sunday. 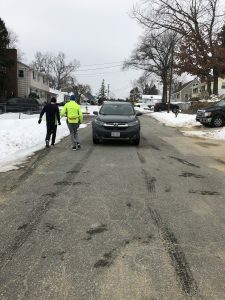 We took the first two loops of my neighborhood with the rigid tether to learn the icy spots well and then switched to the new short, soft tether. A few things stood out immediately. The ability to more precisely guide with the longer rigid tether is significantly better. This is important with ice, potholes or any obstacle really. The first 2 mile loop was mentally demanding and physically as well because I was constantly adjusting my ‘straight’ as the precision guidance and direction is so much less. This causes all the side muscles to work harder. We started developing techniques such as my open hand easing back first against his arm to get better alignment information for turns and for straightening after turns. It would have been easy to jerk on the short tether and unbalance either of us but I mitigated this by having my long arms always ready to extend or retract to make up the extra distance needed. This is an additional constant awareness and an awkward use of my arm but the more we do it the more I’ll get accustomed to it. The reality is I’ve already learned to make arm adjustments for my running. By the end of our run we were reasonably smooth and comfortable, able to talk and joke a little as we ran despite using a higher overall concnertration at this point. We were glad we didn’t have traffic to manage or crowds as well as that it was a shorter distance so I could let my legs recover. Many different muscles were getting overworked and as the mileage increases that will cost me more. Could we do this on a normal road? No. We’d put one of us at risk to cars since we can’t get narrow enough unless the road has wide shoulders. Will we hit more obstacles? Yes, undoubtedly the lower precision means I’ll have to plan to encounter more obstacles we avoid otherwise and that will have a toll at the long distance of a marathon. Will crowd interaction with other runners be harder? I think it’s pretty clear that is a yes but I feel we became smooth enough it will be something we can manage and mitigate with more practice. I’ll continue to hope they reconsider the rule adjustment.